Owning a pet bird provides a child with companionship and teaches the child responsibility and care. Parents must still supervise the day-to-day care so that the bird is not neglected through ignorance or loss of interest. A canary or budgerigar is a particularly good pet for a family with very limited space or modest means. They are suitable for people living alone, especially flat dwellers. The care of these caged birds could hardly be more simple or undemanding, but the individuality they show depends on the degree of freedom they are allowed and on the stimulation provided by their surroundings and their companions. only the male canary sings and whistles, and the male budgerigar is usually easier to teach to talk. There are important differences to be aware of between the genders of each species. Please ask one of our vets regarding a good health care routine. A well-designed and built aviary is the most satisfactory housing for birds, enabling them to live with freedom of movement and adequate opportunity for flight. Circumstances often dictate that birds are kept in cages, usually manufactured of metal with wire mesh screening. The minimum size of cage to house one bird will depend on the breed of bird. Queries regarding cage sizes should be referred to the RSPCA. The cage should be positioned in a well lit, sunny area where the birds will have frequent human contact, and in which it will be safe to be released for exercise if possible. A portable cage stand permits the birds to be repositioned for their comfort. Appropriate perches of varying size must be provided as well as well-secured food and water troughs. The food and water receptacles should not be positioned beneath bird perches and any accidental contamination of the food and water by bird droppings must be removed immediately. Ladders, bells, ropes, swings, mirrors, and suitable toys provide some stimulation for a caged bird, but avoid over-furnishing as this will crowd the cage and may result in injury. At night the cage should be covered over to permit the bird to rest and to protect it from draughts. Should the cage be placed outside the house at any time, it must be in a position that is safe from predators - cats and wild birds – that could scare or directly injure the bird. Birds should not be left in the sun without shade and should be protected from overheating on hot days. A tray on the floor of the cage will collect excreta and should be removed each day and thoroughly cleaned. The cage itself should be easy to scrub out, while water and food troughs and perches should be easily removable for cleaning purposes. It is important to train your bird to be handled, especially to permit examination for signs of ill-health. Begin by letting them become accustomed to being handled in the cage. Soon they will become finger-tame, and then they may be able to be handled outside the cage. It will require a good deal of patience and gentleness when handling birds, especially canaries. Some birds that have constant close contact with their owner will learn to talk. These birds can start to talk at about six weeks of age, and if they have not succeeded by six months, they probably never will. 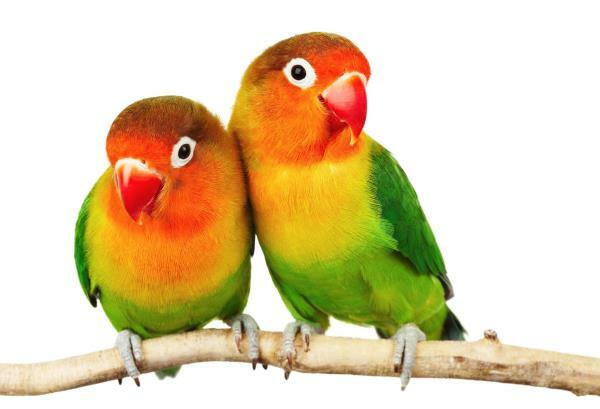 Teaching a bird to talk starts by using the same word over and over. Once the bird has learnt one word, new words or complete phrases may be achieved. The caged bird's basic diet should consist of the specially prepared seed mixtures. This diet should be supplemented with green foods and fruit. Cuttlefish bone should be available in every cage to provide many trace minerals required by birds. Fresh water is essential to a bird’s life and must be replenished frequently in hot weather or if it becomes fouled.